Mike Bell consider trends and opportunities for investors in the UK using Guide to the Markets charts. The referendum result has created great political and economic uncertainty for the UK. The outcome of the negotiations with the European Union will have a large effect on the future of the UK, the value of the pound and the relative performance of different sectors. Domestic vs international exposure, large vs small? The large cap FTSE100 gets most of its revenues from abroad whereas the mid cap FTSE250 has a larger exposure to the domestic UK economy. Therefore a fall in the pound should favour internationally exposed large cap stocks whereas a rise in the pound should favour smaller more domestically focused stocks. After many years of outperformance mid-cap stocks look somewhat expensive relative to large cap stocks. 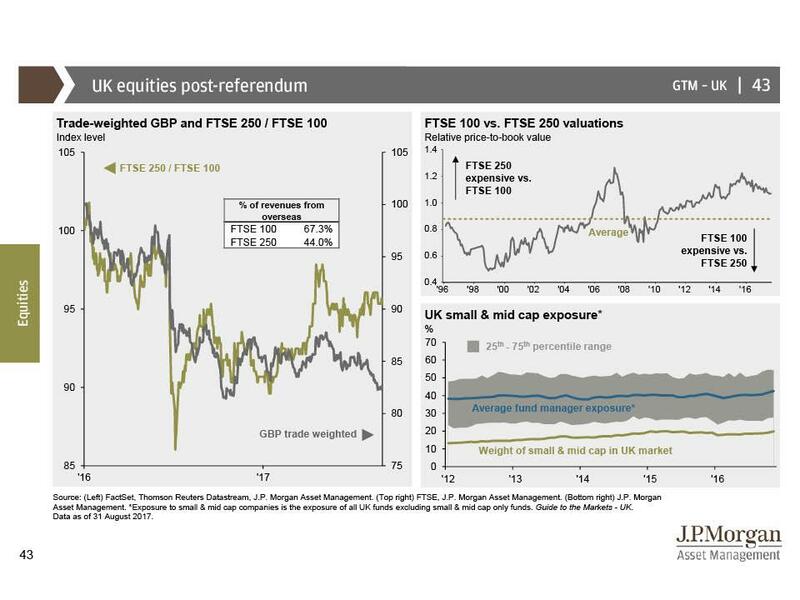 The average UK equity fund has far more exposure to mid and small cap stocks than the FTSE All Share. Earnings expectations for UK-listed companies collapsed for five years, driven mainly by the fall in commodity prices. As commodity prices have recovered from their lows, earnings expectations have improved. 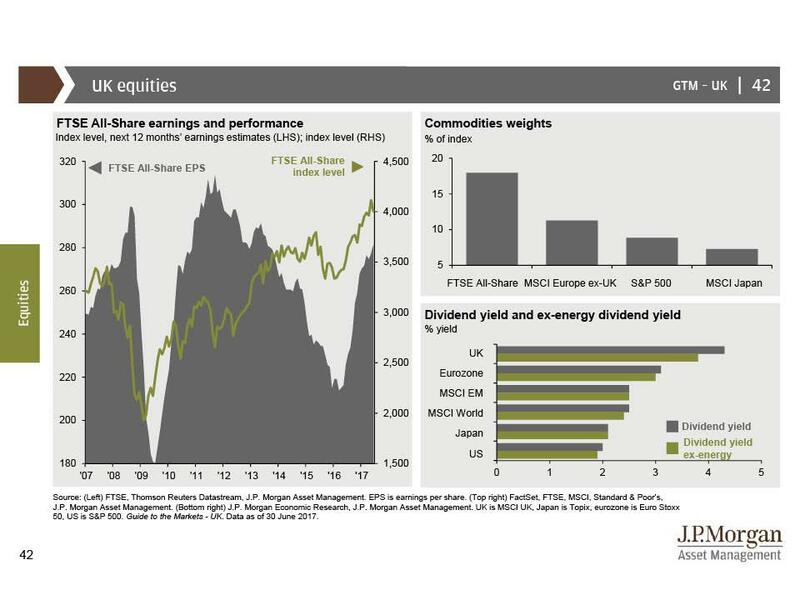 UK equities stand to benefit more than most other developed markets from any further improvement in commodity prices. 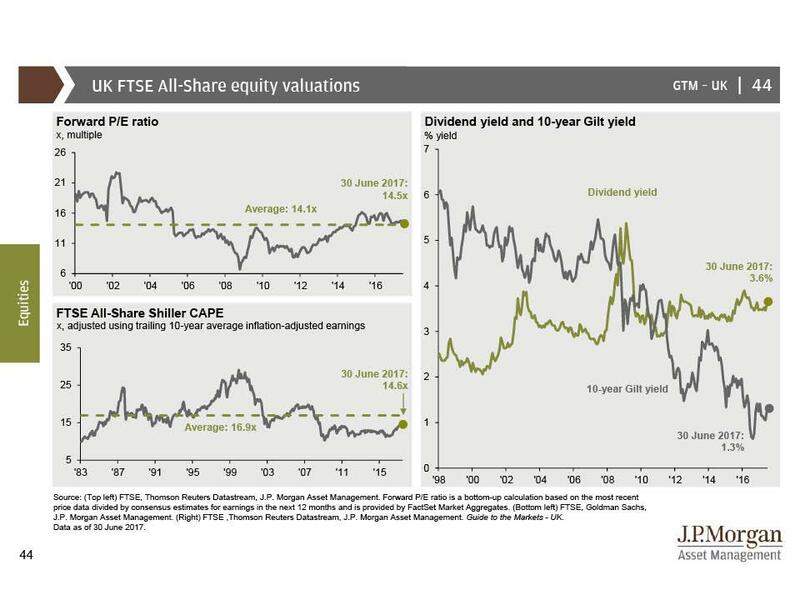 UK equities are neither cheap nor expensive relative to their historical average price-to-earnings (P/E) ratio, but relative to government bonds, the dividend yield available on UK equities looks attractive. UK earnings have plenty of room for recovery after their poor performance in recent years. As a result, the cyclically-adjusted P/E, which takes into account the position in the earnings cycle, leaves UK equities looking very cheap relative to their long-term average. Weaker sterling, combined with undemanding cyclically adjusted valuations and a high dividend yield, could provide support for UK equities. Large-cap equities are less exposed to potential domestic economic weakness than mid- and small-cap companies. That said, the uncertainty created by the Brexit negotiations argues for taking relatively small active sector and size bets relative to the benchmark.